*8) NO GREED NO NEED – Greed has caused more damage to the relationships of families and friends and nations. When a child cannot access the basic necessities of life, its a display of greed where inordinate things are more valuable than people and leaders of nations care less about its own people. Young children along with their parents are now homeless. 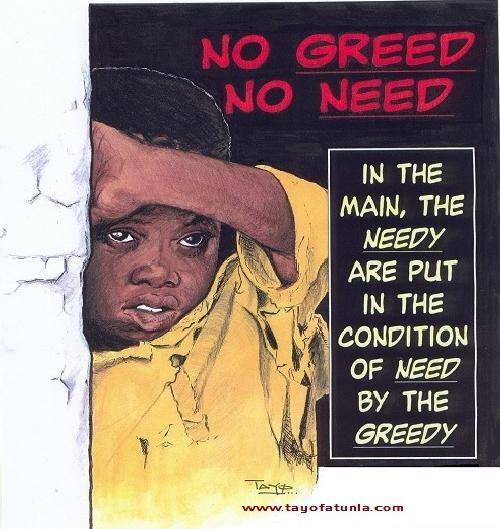 This source of greed shows that material things are more important than the survival of people young and old. Where there is no proper accountability in third world nations, greed thrives, Giant companies avoid paying much TAXES by putting monies in Tax Havens as the poor continue to get poorer.